We had so many links to the "Summer Cloche Party". I have had a ball looking at all of them. Thank you all so much for joining in the fun. I sincerely want to thank Chie at CHUBBY AND CHIEQUE for having such a fabulous giveaway for everyone that joined the party. I do hope you will all visit her, she lives in Sweden and such a very special and precious lady. All of the gifts will come from there. OK, on with the winners. Congratulations to the winners. If you don't know these ladies, please visit their blogs, you will love them. Please email me your address @ astrollthrulife@live.com and I will forward it to Chie so she can mail your gift. Thank you all again for such a great party, and a special thanks to the wonderful Chie. 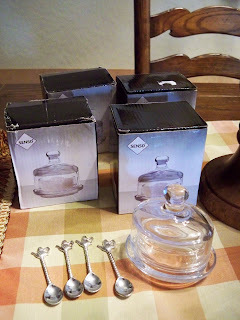 I've had such a great time looking at all of the links to your cloche party! Although I was not able to join the party I have really enjoyed looking through all the links. The cloche I had unfortunately shattered after a run in with one of my boys :)! The cloche party was great fun! congrats to the winners of the lovely goodies. Congratulations Fabby, Poppy and Mercy! Here's my address in the USA. Congrats to all the winners! Awesome giveaway prizes. Congrats to all the lucky winners! Thank you for hosting the cloche parties. They are always so much fun and I know that there are a lot of us here in blogland that look forward to them! p/s I loved the post you did a couple of weeks back with the cows and cattle photos. I love paintings with grazing cattle too. You featured so many beautiful images! I tried to comment then but our internet service kept going in and out! Anyway, just wanted to say how much I enjoyed that post to! Im so happy for Farry's being the winner ~~ congratulations sweet lady. Im also happy for Poppy. I'm so sorry I missed your party, Marty! Hey, that rhymes. I've got a lot going on in my life, and trying to sell off stuff to move on. Hopefully my life will be settled for the next one. Hey, how did you get the Hobby Lobby ad? I love HL. I would like to congratulations Mercy for your win also. I fell off my chair to see my name as one of the winners. Never in a million years did I think I would be one of the winners with such awesome entries that were posted by all. Congratulations to Poppy & Fabby on their win as well!! A big thanks to Chie for her wonderful gift & Marty for all your encouragement & tips you have provided.